1. Grate the zucchini into a sieve and leave to sweat for 10 minutes. 2. Combine flour and eggs in a large mixing bowl and mix until smooth. 3. Using your hands squeeze the excess moisture from the zucchini and place into the mixing bowl. Add McCain Peas, haloumi, onion, mint, dill and lemon zest to mixing bowl and stir well to combine. Season with salt and pepper. 4. Add enough canola oil to a frying pan to come 5mm up the side of the pan and heat over medium heat. Spoon 2 level tablespoons batter into pan, spreading slightly with a spatula. Repeat to fill pan, allowing room for the fritters to spread. Cook for 2 to 3 minutes each side or until golden and cooked through. Transfer to a plate lined with paper towel and repeat with remaining mixture. 5. 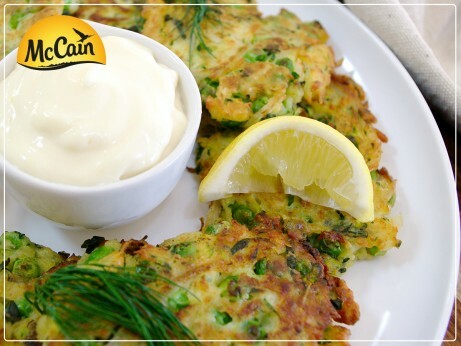 Scatter fritters on a serving plate, top with fresh dill sprigs and serve with lemon wedges and aioli. 1 Grate the zucchini into a sieve and leave to sweat for 10 minutes. 2 Combine flour and eggs in a large mixing bowl and mix until smooth. 3 Using your hands squeeze the excess moisture from the zucchini and place into the mixing bowl. 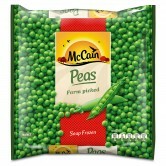 Add McCain Peas, haloumi, onion, mint, dill and lemon zest to mixing bowl and stir well to combine. Season with salt and pepper. 4 Add enough canola oil to a frying pan to come 5mm up the side of the pan and heat over medium heat. Spoon 2 level tablespoons batter into pan, spreading slightly with a spatula. Repeat to fill pan, allowing room for the fritters to spread. Cook for 2 to 3 minutes each side or until golden and cooked through. Transfer to a plate lined with paper towel and repeat with remaining mixture. 5 Scatter fritters on a serving plate, top with fresh dill sprigs and serve with lemon wedges and aioli.